We are no longer accepting applications for Fall 2019. Internship openings for Spring 2020 will begin in August. Are you a graduate student pursuing policy studies related to national security and defense, international affairs, or cybersecurity? Apply to one of the most unique internship opportunities in the Washington, D.C. area. INSA is often on the lookout for graduate students interested in broadening their knowledge of the intelligence and national security communities. Our interns work closely with our member-driven policy councils, gaining valuable exposure to both contemporary intelligence issues (at the unclassified level) and the key stakeholders pursuing them. With the networking and professional development opportunities afforded them, INSA interns are well positioned to pursue highly sought employment in the public and private sectors. Recent INSA interns have found employment after graduation with Booz Allen Hamilton, The Center for Strategic and International Studies (CSIS), The Chertoff Group, Defense Intelligence Agency (DIA), Deloitte, FBI, U.S. Department of Homeland Security (DHS), MITRE, National Security Agency (NSA), Noblis, and U.S. Department of State. 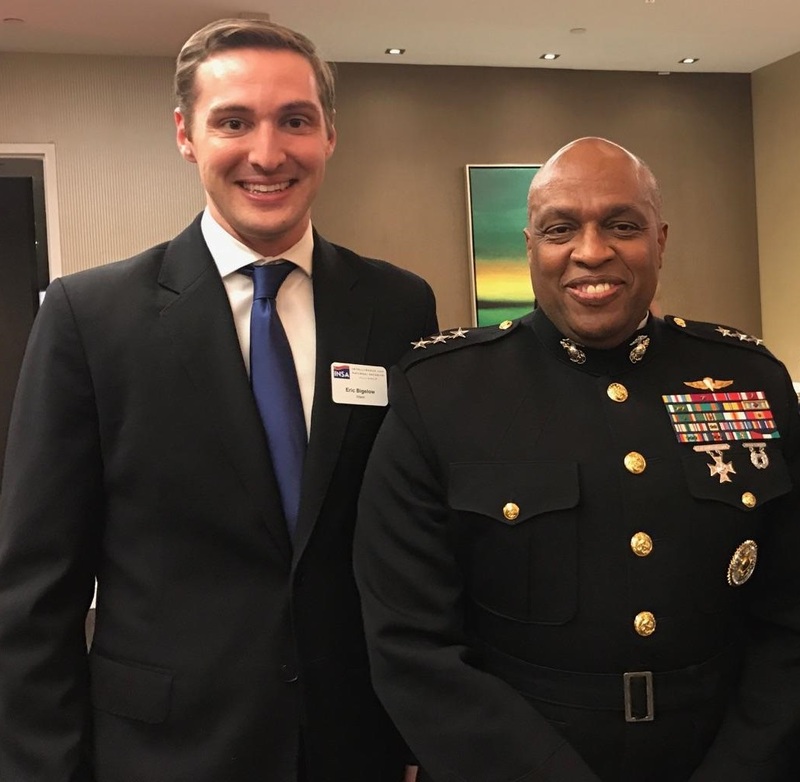 Intern Eric Bigelow with DIA Director Lt. Gen. Vincent Stewart, USMC, at an INSA Leadership Dinner in 2016. Networking. INSA provides many unique forums to build your professional network, from evening events, both large and intimate, to brown-bag lunches with Intelligence Community mentors and senior members, as well as hiring managers from government and industry. Professional development. INSA interns are afforded tremendous responsibility as the primary support staff to INSA’s policy councils, overseeing administration and contributing to policy products. Interns will contribute to project management, professional writing, event planning, data collection, and more. Practical engagement of intelligence issues. One challenge to entering the intelligence field is developing your résumé before you have received a security clearance. INSA offers a unique opportunity for you to make meaningful contributions to policy initiatives in an unclassified environment. Applicants are not required to have specialized expertise in intelligence or national security, although relevant coursework at the undergraduate or graduate level is a plus. All applicants should be highly motivated and sincere in their desire to pursue a career in intelligence or national security. * INSA does not offer summer-only internships and requests applicants seeking a May/June start firmly commit through December. 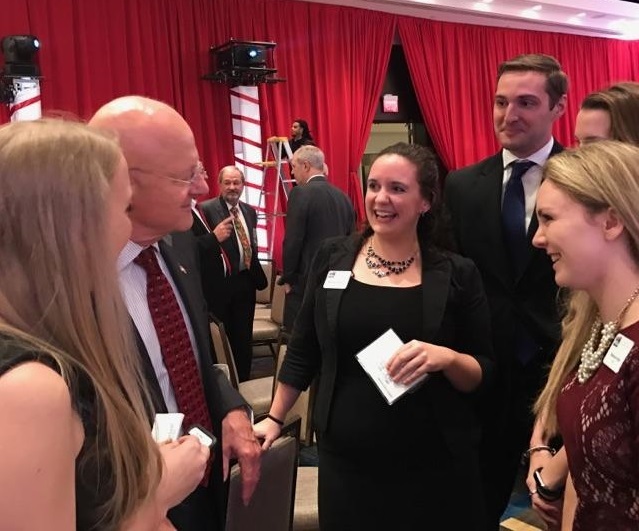 Director of National Intelligence James Clapper chats with interns at an INSA Leadership Dinner in 2016. This is a paid hourly position of $11/hour. INSA cooperates enthusiastically with universities and career services offices that allow students to receive academic credit or other arranged compensation for their efforts. Internship applications are accepted throughout the year, including from admitted students who have not yet begun their graduate program. To be considered, please submit a cover letter identifying the INSA policy councils you would be most interested in working with and résumé to internship@insaonline.org. Potential applicants are encouraged to apply early in their graduate school enrollment. Interns are hired on an as-needed basis and open application periods may not align with semester calendars. Applicants will be notified if they are a candidate for an opening.